Digiflavor introduces their Siren 2, a follow up to their original Siren GTA MTL Tank, now with a 22..
New model from Hcigar: Kayfun Lite V2Comes with nano kit in a blue pouch.We think this is th.. The Innokin Ares RTA by Phil Busardo and Dimitris Agrafiotis (the Vaping Greek) is a highly anticipa..
SXK Clone of the Airlab RDA.Comes with BF Pin ..
SXK clone of the Armor RDA.Comes with BF Pin ..
SXK clone of the Armor V2 RDA.The Armor V2 is similar to the V2 but boasts a modified top cap de..
SXK clone of the E-Phoenix Resurrection v2. This is the modified 2 post SXK version.ONL..
SXK clone of the Flav RDA.Comes with BF Pin ..
SXK clone of the Hellfire Sentinel RDA.One of the best single coil flavour RDAs on the market! ..
SXK clone of the Hurricane Jr ..
SXK Clone of the Hussar RDA.Comes with BF Pin ..
SXK clone of the Hussar RDTA ..
SXK clone of the Kayfun Prime. Available in SS, full gold or gold/black combo. The colors a..
SXK Clear cap for the Kayfun PrimeReplaces the middle section. Still uses top part for filling! ..
SXK clone of the Kayfun Prime extension kit! Convert your prime to take 4.5ml of liqui..
SXK clone of the Kayfun V5. Made of 316 Stainless Steel. This clone is very close to the au..
SXK clone of the Kayfun V5 in a Mini version.The only difference between the normal V5 is the ch..
SXK clone of the KRMA RDA.Available in Black or SSComes with Replacement O-rings and BF..
SXK clone of the KrytenMade of 316 Stainless Steel ..
SXK clone of the NarCA RDA, successor of the NarDA!Comes with BF Pin ..
SXK NaRDA cloneMade of 316 Stainless Steel, this is a 1:1 clone.This RDA is an excellent fla..
Bell Cap for the SXK Narda ..
SXK clone of the Pico V2 ..
SXK clone of the Pocket RTA. ..
SXK clone of the Rose V3 .. Launched in 2014, The Vaporist wants to be your trusted source for everything related to e-cigarettes and vaping! We want to be your one stop vape shop for all vaporizer needs! We strive to provide best in class cusotomer service and the highest quality e-liquids at the best and lowest price! 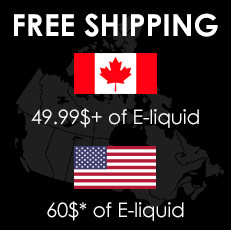 We ship to every province in Canada and the USA. We service British Columbia, Alberta, Saskatchewan, Manitoba, Ontario, Quebec, New Brunswick, Nova Scotia, Prince Edward's Island, Newfoundland and Labrador, Yukon, The Northwest Territories and Nunavut ! Copyright © 2019 The Vaporist Inc.